Day 30: tangled in words..
One of the many sonnets. Yes I’m nerdy/geeky/dorky/ whatever you may call it, enough to like Shakespeare. He does not belong to today’s world and yet he does. Love is still the same after he described it some 400 odd years ago. Or is it?.. Maybe not. Maybe that’s why I find myself alienated when hearts get broken and people move on like nothing ever happened..
Anyways I digress. What I really started today’s post was for a request. Love of reading precedes my love of writing. The smell of old and new books..the promise of a story.. of lots of new ideas and thoughts gets me happy. Curling up with coffee and a book is always high on my priority list. 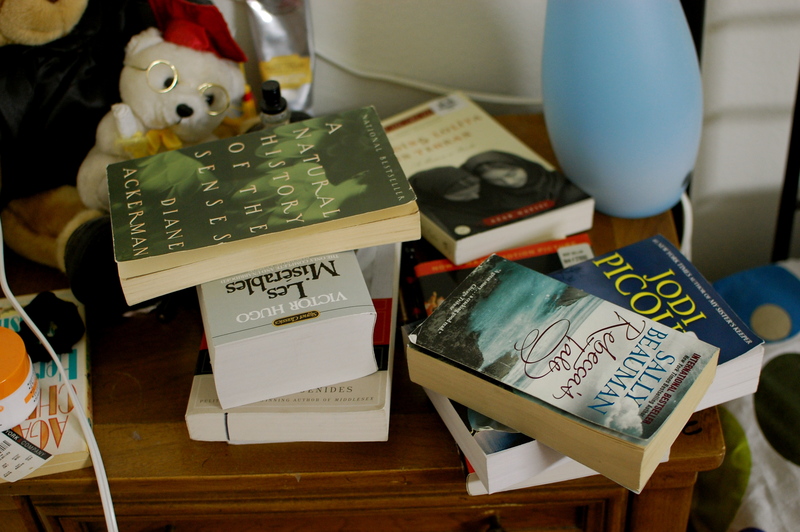 (Yep, some may call it a sad life) Well anyways, the stack at my night stand has left me uninspired lately. So please help me out with a new reading list..
Rules: Don’t take too long to think about it. Tell me fifteen books you’ve read that will always stick with you. First fifteen you can recall in no more than 15 minutes. PS: Thought I’d share this find with you. If you enjoy illustrations and graphic design, maybe you’d find this interesting.